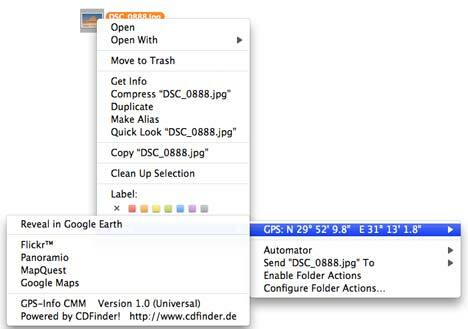 Norbert M. Doerner, who is behind disk cataloguing tool CDFinder (reviewed here), has now come out with a free contextual menu module for Mac that lets you easily view the location on Google Earth and other mapping services of any photo containing coordinates in its EXIF metadata: GPS Info CMM. What is really cool is that the links to Flickr and Panoramio put you one click away from viewing tons of photos near the location of your own picture. It’s a small download, it’s free, and does one thing exceedingly well.